There are various health benefits derived from celery and its juice. The medical virtues of celery were first described by the Greeks Discorides and Pliny. In the early middle ages celery juice was very beneficial for curing ailments such as stones, constipation, menstrual problems and for health disorders of the liver and gall bladder. The green leaves and stem and the bulbous root of celery are all extremely rich in active ingredients that make celery a very important medicinal plant and very beneficial to health. 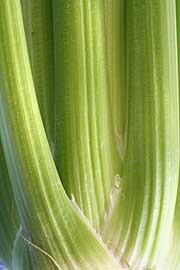 There is a well balanced content of the basic minerals, vitamins and nutrients, but in addition there are important concentrations of plant hormones and the essential oils that give celery its strong and characteristic smell. These oils have a specific effect on the regulation of the nervous system, and have a great calming influence. It is the presence of the essential oils which makes celery special. These are also found in the seeds and, if available, they too can be added to the juice. Celery is used for its strong stimulating and beneficial effect on a weak sexual system, but as is usual with plant therapies the normally active person does not have to fear an uncontrollable upsurge. Plant therapy tends to make the system normal. Like beet there is also a general health tonic effect. The strong diuretic (water removing) powers of celery enable it to be used in the control of health problems such as arthritis and rheumatism. Sufferers cannot have too much and may consume the vegetable cooked or raw, or in juice form which is the most health effective treatment of all. A tablespoonful of honey in celery juice, sipped slowly, will very effectively reduce the appetite if taken before a meal, and makes a delightful drink. You can take the same mixture as a nightcap when it will help you to relax into a soothing and restful sleep. Those who take the juice who have in the past suffered from a tendency towards stones in the gall bladder or the kidneys usually find that these painful deposits do not form again. It seems likely that this effect is related to the anti-arthritic properties of the juice.